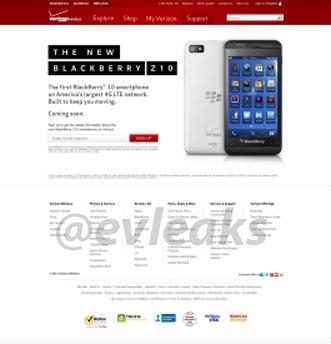 Leaked promo page shows Verizon BlackBerry Z10 | BlackBerry Blast! All of the major US carriers have already announced they will carry the new BlackBerry 10 devices. Now we see evidence that Verizon is definitely on board in a new leaked promo page. Twitter user @evleaks posted the leaked promo page that clearly shows Verizon will have its own version of the BlackBerry Z10. The image is so small that you can't make much else out, but BB10 is definitely on its way to Verizon.